I went to Afghanistan in November. Although the stay was very short, we managed to get a lot done. So, I am writing a report as usual because I believe you are entitled to know what is going on. Without you and your trust, none of this work would be possible. the weather gets better. We still need to build a library and lab for them as well. Most schools are closed during the winter, and so the girls will start in the new schools in March - the usual beginning of the Afghan school year. The girls are very appreciative for everything. We also visited the women's prison in Herat which is in very bad condition. Most the women in the prisons have not committed any crimes but rather are imprisoned for no reason or for running away from family abuse or forced marriages. Winters in Afghanistan are very cold, so we provided them with heaters and new water boilers and paid for their installation and fuel for a month with hope that the government will provide them with fuel after that. We wish we could bring them justice as well. We also went to the burn ward at the Herat Hospital. Self-immolation is very high among women in Herat; many of the patients at the burn ward were these women. The hospital is in poor condition, has few medical supplies, and unpaid workers. They even recycle some of the supplies such as gauze to wrap burns. We managed to get hospital supplies for them and pay the employees' salaries (3 doctors, 7 nurses, and 3 cleaners) for a year. The Family Guidance Center, WAW's latest project, is underway. The director, Manizha Naderi, has rented and renovated a building in the heart of Kabul that will serve as WAW's office and the center. Furniture is being bought, Internet and heat installed. She is currently in the process of hiring the social work staff and arranging for their training. This center will be unique in Afghanistan in that men and children, the entire family constellation, will be included in the treatment. This center will help women determine their future. It will also act as a temporary shelter for women and children who can't return home because domestic abuse remains a threat. Also in Kabul, we gave 624 blankets for people endangered by the harsh cold. The war devastated the whole country, and people continue to live in ruined buildings with no doors or windows, and sometimes no roof - and so they have no protection from the cold winters in Afghanistan. We opened 13 literacy classes in Kabul (Kamari) and Parwan (Saray and Mir Bacha Kot). In Logar, we continued to support 28 orphans (their pictures are on the website, sponsors needed) including donating blankets. We also opened 4 computer classes and 3 sewing classes for women there. In Ghazni province we took warm clothes to an orphanage as the winter is very harsh there and they were in great need. 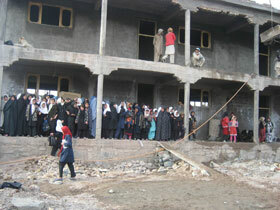 My goal for this year is to build 5 more girls' schools in Logar and Laghman provinces. I know it sounds like a big project but with your help and support we'll be able to accomplish this goal. I want to thank you all for your continued support.